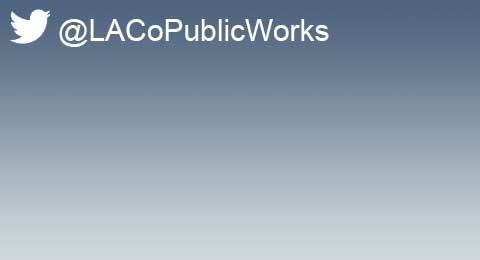 We provide regional leadership in emergency management for public works services to sustain resilient and safe communities. County residents&apos; lives and property are protected from major bridge failures during earthquakes by implementation of the Bridge Seismic Retrofit Program. Percentage of previously non-compliant bridges meeting State seismic requirements. 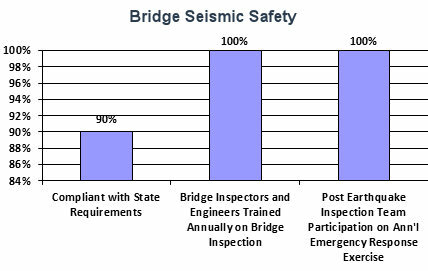 Percentage of bridge inspectors and engineers trained annually on bridge inspection and reporting protocols for routine and emergency events. Percentage participation of annual emergency response exercise by the Post-Earthquake Bridge Inspection team members. 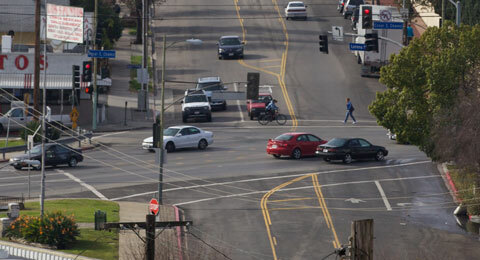 Of the remaining 22 bridges, 7 are currently under construction of retrofit measures and 15 are in the design phase. Training of bridge inspectors and engineers has ensured consistency in their reporting on performance of the bridges and identifying issues. Annual post-earthquake inspection drills have increased readiness of staff to respond to bridge safety emergencies. Increased coordination with State to secure approval for funding for construction. Continued oversight to complete the design plans for the remaining bridges. Protocol manuals and training exercises are updated annually to address issues encountered throughout the year. Have a well trained and equipped workforce ready to respond to the types of daily incidents faced by the Department as well as be prepared to carry out our role in a larger disaster under the Statewide Emergency Management System (SEMS). Provide the first responder service within the adopted time standard. In 2011, Dispatch coordinated almost 49,000 service calls. In 2011, the Department Operations Center (DOC) was activated on multiple occasions during periods of heavy rainfall and a major windstorm event. This DOC also was the site of monthly refresher training for personnel to ensure operational readiness in the event of an activation. 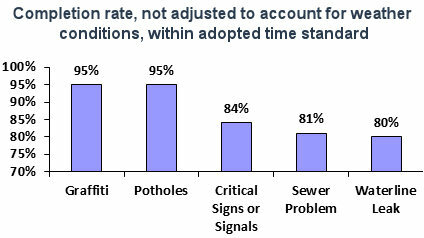 The following are the number of work orders or individual responses that were generated in 2011 for first responder services that have an adopted time standard for performance: 29,458 for graffiti; 28,057 for potholes; 3,526 for critical signs or signals; 472 for sewer problem; and 151 for waterline leak. Ensure that adopted time standards are clearly communicated to those providing the function. Ensure that a minimum anticipated completion rate is established for these First Responder Services. 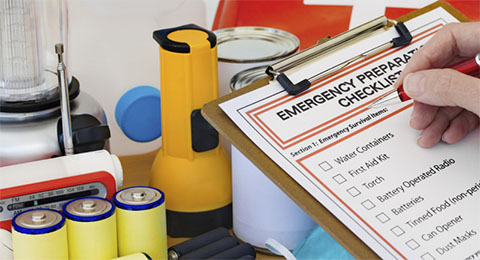 Continuously plan for emergencies and disasters by 1) ensuring 100% of employees are familiar with their roles under Administrative Directive A-135, Employee Responsibilities in an Automatic Emergency Response; 2) ensuring 100% of employees have received the mandated Disaster Services Worker training; 3) train DOC personnel on the National Incident Management System and the State-mandated SEMS operating procedures. County residents&apos; lives and property are protected from major dam failures during floods and earthquakes by implementation of the Dam Safety Program. Percentage of previously non-compliant dams meeting State seismic and spillway requirements. 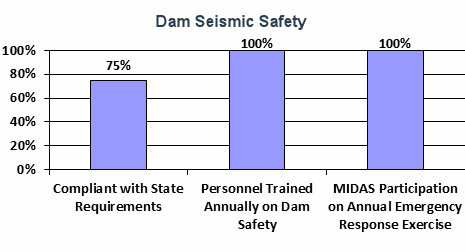 Percentage of Dam Operators/Assistant Dam Operators trained annually on dam safety monitoring and reporting protocols for routine and emergency events. Percentage participation of annual emergency response exercise by Review Committee on Dam Safety MIDAS members. Of the remaining 5 dams, 1 is currently under construction of remedial measures, 2 are in the design phase, 1 has a completed concept being reviewed by the State, and 1 (Puddingstone Dam) is planned to be operated perpetually within the restriction imposed by the State. All are currently operated safely within the restrictions imposed by the State. Training of Dam Operators has ensured consistency in their reporting on performance of the dams and identifying issues. MIDAS exercise has increased readiness of staff to respond to dam safety emergencies. Increased coordination with State to accelerate review of concept for Santa Anita Debris Dam. Protocol manuals and training exercise are updated annually to address issues encountered throughout the year.